Trinity Plumbing of Tampa Bay Corp was established in 2007. Tom Davis, the owner, has been a licensed plumbing contractor since 1987. 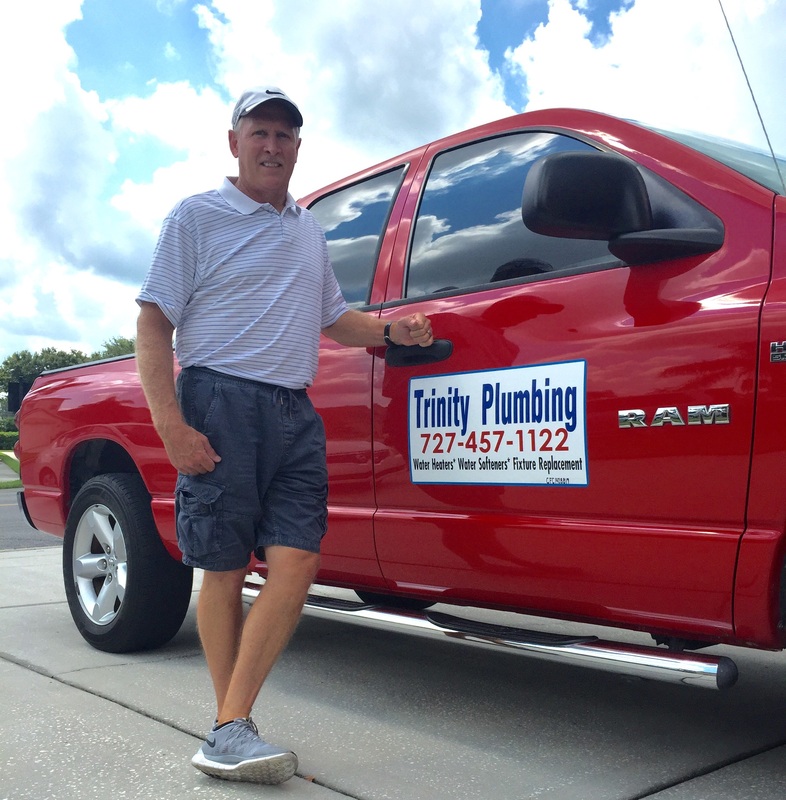 He started in the plumbing business in 1979 in North Carolina. Tom and his family moved to Trinity, Florida in 2003. He quickly saw the growing need of a reputable plumbing repair and water conditioning service in the area and started Trinity Plumbing soon after. Trinity Plumbing specializes in plumbing fixture repair and replacement, and water heater repair and replacement, and water softening and conditioning system installation. The company is licensed and insured. Q: What is the benefit of using a local plumber as opposed to doing the work myself? A: While the Trinity area has grown fast, many of the builders in the area were using, and still use, inexpensive plumbing materials so that they can keep cost down while building their homes. There are also “fly by night” plumbing companies all over the area ready to take advantage of your plumbing needs. You have big box stores in the area trying to sell you fixtures and services for rock bottom prices. As the old saying goes, “you get what you pay for”! I am an honest person and have been taught to do work the right way the first time, and to always treat others as you would want to be treated. I live in your community and I will work very hard to help you keep your plumbing system in tip top shape at a reasonable price. Q: What plumbing services do you specialize in? A: Trinity Plumbing prides itself on cleaning up the water coming into your home to protect you, your family, and your plumbing fixtures/appliances. We also want to put quality plumbing fixtures and parts back in your home when they are needed. We specialize in replacing water heaters, faucets, sinks, garbage disposals, and toilets in your home. Q: What is the guarantee on Trinity Plumbing's work? A: Our workmanship is 100% guaranteed. The products are warrantied by the manufacturer of the products we use, i.e. Moen faucets have a lifetime guarantee. Q: Why do I need a water softening system for my home? A: I always recommend that every house in our area of Florida have a water softener and Reverse Osmosis drinking water system. The water in Florida is very aggressive and full of minerals that attack and coat our plumbing fixtures, appliances, pipes, dishes and shower doors. A water softener is the first step in combating our “hard” water. The “hardness” of our incoming water from the Tampa area water systems is “extremely hard” and runs around 15 to 20 grains hard on average. Your water needs to be in the “normal” range of 2 to 4 grains hard. The water softener we can supply and install will do this for your system. I have been using the same water softening system, made in the USA, for close to 30 years. I have this softener system in my own home. It is dependable and works great, unlike the inexpensive softener models sold at the big box stores for do-it-yourselfers, and also much less than the large, national water softener companies. Our plumbing fixtures, including faucets, toilets, water heaters, and dishwashers will last longer with a water softener. Those cloudy spots left on your dishes and shower doors will disappear when using a water softener. Q: What is the benefit of a water filtration system for my home? The taste of the water in our area is awful in my opinion, and that of many others. Having to drink bottled water is a must for most every family in the Tampa Bay area, Trinity included. Having Trinity Plumbing install a reverse osmosis drinking water system lets you have clean, mineral free and odorless drinking water in your home. Your refrigerator may have one carbon filter to try to clean your drinking water but you can still smell and taste the bad water. My reverse osmosis systems use three filters and the RO membrane to completely take odors and minerals out of your water.